روحی پناه, فاطمه, میررکنی, سید مجید, مساح بوانی, علی‌رضا. (777). بررسی توانمندی مدل SDSMدر ریزمقیاس­نمایی دما و بارش در اقلیم گرم و خشک (بررسی موردی: ایستگاه‌های همدیدی یزد و طبس). مجله ژئوفیزیک ایران, 9(4), 104-125. فاطمه روحی پناه; سید مجید میررکنی; علی‌رضا مساح بوانی. "بررسی توانمندی مدل SDSMدر ریزمقیاس­نمایی دما و بارش در اقلیم گرم و خشک (بررسی موردی: ایستگاه‌های همدیدی یزد و طبس)". مجله ژئوفیزیک ایران, 9, 4, 777, 104-125. روحی پناه, فاطمه, میررکنی, سید مجید, مساح بوانی, علی‌رضا. (777). 'بررسی توانمندی مدل SDSMدر ریزمقیاس­نمایی دما و بارش در اقلیم گرم و خشک (بررسی موردی: ایستگاه‌های همدیدی یزد و طبس)', مجله ژئوفیزیک ایران, 9(4), pp. 104-125. روحی پناه, فاطمه, میررکنی, سید مجید, مساح بوانی, علی‌رضا. بررسی توانمندی مدل SDSMدر ریزمقیاس­نمایی دما و بارش در اقلیم گرم و خشک (بررسی موردی: ایستگاه‌های همدیدی یزد و طبس). مجله ژئوفیزیک ایران, 777; 9(4): 104-125. ازآنجاکه سامانه‌های انسانی مانند کشاورزی و صنعت، که وابسته به عنصر‌های اقلیمی‌اند، بر مبنای ثبات و پایداری اقلیم طراحی شده و عمل می‌کنند؛ ضروری است تغییرات بلندمدت دما و بارش، که مهم‌ترین چالش در قلمرو علوم محیطی است، شناسایی شود و مدنظر قرار گیرد. برای پیش‌بینی بلندمدت عنصر‌های اقلیمی در دوره‌های آتی، استفاده از مدل‌های اقلیمی جهانی (GCMs)اجتناب‌ناپذیر است. به علت تفکیک درشت یاخته محاسباتی GCMs، ضروری است برای پیش‌بینی‌های مقیاس محلی و ناحیه‌ای از روش‌های ریزمقیاس‌نمایی برای تبدیل داده‌های بزرگ‌مقیاس به داده‌های مقیاس‌ محلی و ناحیه‌ای استفاده شود. هدف پژوهش حاضر، بررسی توانمندی مدل SDSMدر اقلیم گرم و خشک برای ریزمقیاس‌نمایی دما و بارش حاصل از خروجی مدل HadCM3تحت سناریوی A2است. در این راستا از داده‌های روزانه بازتحلیل NCEP/NCARو ایستگاهی دما و بارش در دورة 1961-2001 و داده‌های خروجی مدل HadCM3تحت سناریوی A2در دورة 1961-2001 شامل دما و بارش برای تولید سناریوی آتی با مختصات ایستگاه‌های همدیدی یزد و طبس استفاده می‌شود. مقایسه نتایج حاصل از تحلیل آماری برای هر دو مجموعه داده مشاهداتی و ریزمقیاس‌نمایی‌‌شده نشان می‌دهد که، مدل SDSMدر ریزمقیاس‌نمایی دمای خروجی مدل HadCM3در اقلیم گرم و خشک به‌درستی عمل می‌کند. بارش روزانه حاصل از ریزمقیاس‌نمایی به‌کمک مدل SDSMدر اقلیم گرم و خشک با داده مشاهداتی در اغلب آماره‌ها از جمله حداکثرها و حداقل‌های بارش تفاوت بارزی دارد. فقط برخی از آماره‌ها در مورد بارش مانند جمع ماهانه و حداکثر روزهای خشک متوالی با داده‌های مشاهداتی همخوانی دارند. Since human systems such as agriculture and industry, which depend on climatic elements, are designed and created based on compatibility and stability of climate, it is essential that the long-term changes of temperature and precipitation, which constitute the most important chanllenges in the environmental sciences, are identified and considered. In ordet to long-term forecast climatic elements for future periods, the use of Global Climate Models (GCMs) is inevitable. Typically, GCMs have a resolution of 150-300 km in each horizontal direction. Many impact applications require the equivalent of point-wise climate observations and are highly sensitive to fine-scale climate variations that are parameterized in coarse-scale models. Due to the coarse-resolution of the computational cell of GCMs, it is essential to use a downscaling procedure in order to convert large-scale data to regional/local-scales data. Downscaling aims to obtain fine-resolution climate or climate change information from relatively coarse-resolution GCMs. In general, downscaling is divided into dynamical and statistical categories. Dynamical downscaling fits output from GCMs into regional meteorological models such as Weather Research Forecasting (WRF) model. Thus, due to the fine-resolution (20-60 km) of the limited area models, it is possible to simulate some regional climatic features such as orographic precipitation, cloudiness, and some exetrem events. In climatological and meteorological researches using dynamic downscaling, a researcher can achieve both global-scale projections down to a regional/local-scale and the effect of global patterns on local weather conditions. The amount of computations involved in dynamical downscaling makes it computationally expensive to produce decades-long simulations with different GCMs or multiple emissions scenarios. The statistical downscaling method is created based on statistical relationships that link the large-scale atmospheric variables with local/regional climate variables. This method has many advantages such as being easy to apply, and computationally economical. As a result, in most regional/local researches, statistical downscaling is used to consider potential impacts on specific regions or stations. In this method using appropriate statistical relationships between predictor and predictand variables, it is possible to determine the relationships for future periods. In general, if the long-term data exist for the desired station, the best method is statistical downscaling. To determine the best statistical method for downscaling in each region, it is necessary to investigate the capabilities of various statistical methods. The aim of the present research is to investigate the capability of Statistical Downscaling Model (SDSM) in a hot and dry climate to downscale temperature and precipitation as output from Hadley Centre Coupled Model, version 3 (HadCM3) under scenario A2. Several modeling tools are employed in generating the sets of Intergovernmental Panel on Climate Change (IPCC) emission scenarios. The scenario A2 is one of the IPCC emission scenarios. This scenario is based on the following assumptions; a- relatively slow demographic transition and relatively slow convergence in regional fertility patterns, b- relatively slow convergence in inter-regional gross domestic product per capita differences, c- relatively slow end-use and supply-side energy efficiency improvements, d- delayed development of renewable energy, and e- no barriers to the use of nuclear energy. As mentioned earlier, characteristically dry and hot climate is considered to evaluate the performance of SDSM model. Therefore, daily NCEP/NCAR reanalysis and station data during the 1961-2001 period and output from HadCM3 under scenario A2 for 1961-2001 period containing temperature and precipitation for Yazd and Tabas synoptic stations are used. Comparing the results obtained from statistical analyses for observational and downscaled data indicates that the SDSM model can downscale correctly temperature output from HadCM3 in hot and dry climates. Daily precipitation resulted from downscaling using SDSM model has marked differences with observational precipitation in most of the statistical quantities used such as maximum and minimum precipitation. Only some statistical quantities such as the sum of the monthly precipitation and maximum consecutive dry days are consistent with the observed data. آساد، م.ت.، حیدری، ب.، 1390، تحلیل رگرسیون کاربردی: انتشارات جهاد دانشگاهی مشهد، ص 177. رضائی، ع. م.، سلطانی، ا.، 1377، مقدمه ای بر تحلیل رگرسیون کاربردی: دانشگاه صنعتی اصفهان، مرکز نشر. روحی پناه، ف.، میررکنی، س. م.، مساح بوانی، ع. ر.، نصر اصفهانی، م. ع.، a1392، بررسی توانمندی مدل ریزمقیاس نمایی SDSMدر انتخاب بهترین متغیرهای پیش بینی کننده: پانزدهمین کنفرانس دینامیک شاره ها. دانشگاه هرمزگان، 26-28 آذر. روحی پناه، ف.، میررکنی، س. م.، مساح بوانی، ع. ر.، b1392، مقایسه روشهای واسنجی برای شبیه سازی دما به کمک مدل ریزمقیاس نمایی ) SDSMمطالعه موردی شهر یزد): شانزدهمین کنفرانس ژئوفیزیک ایران. دانشگاه تهران. روحی پناه، ف.، میررکنی، س. م.، مساح بوانی، ع. 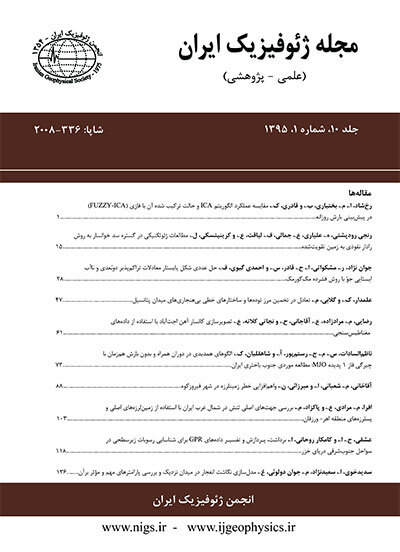 ر.، c1392، بررسی تغییـرات دما و بارش ایستگاه همدیدی شهرستان یزد در دوره 2011-2040 به کمک مدل ریزمقیاس نمائی :SDSMاولین همایش ملی جغرافیا، شهرسازی و توسعه پایدار. دانشگاه خواجه نصیرالدین طوسی. مساح بوانی ع. ر.، مرید، س.، 1384، اثرات تغییر آب وهوا بر جریان رودخانه زاینده رود اصفهان: مجله علوم و فنون کشاورزی و منابع طبیعی، 4، 17-27. مساح بوانی، ع. ر.، 1385، ارزیابی ریسک تغییر اقلیم و تاثیر آن بر منابع آب مطالعه موردی حوضة زاینده رود اصفهان: رسالة دکتری، گروه مهندسی سازههای آبی، دانشگاه تربیت مدرس. مهدی زاده، م.، مهدیان، م.ح.، حجام، س.، 1385، کارایی روشهای زمین آماری در پهنه بندی اقلیمی حوضة آبریز دریاچة ارومیه: مجله فیزیک زمین و فضا، 1، 103-116. هراتیان عرب، ا.، مساح بوانی، ع. ر.، براتی، غ. ر.، 1388، ریزگردانی آماری متغیرهای دما و بارش (مطالعه موردی شهر همدان): پایان نامة کارشناسی ارشد جغرافیا گرایش اقلیمشناسی، دانشگاه رازی. Bluestein, H. B, 1993, Synoptic-dynamic Meteorology in Midlatitudes. Volume II. Observations and Theory of Weather Systems: Oxford University Press, 594 pp. Charles, S. P., Bates, B. C., Smith, I. N., and Hughes, J. P., 2004, Statistical downscaling of daily precipitation from observed and modelled atmospheric fields: Hydrological Processes, 18(8), 1373-1394. Chen, H., C.-Y., Xu, and Guo, S., 2012, Comparison and evaluation of multiple GCMs, statistical downscaling and hydrological models in the study of climate change impacts on runoff: J. Hydrology, 434, 36-45. Dibike, Y. B., and Coulibaly, P., 2005, Hydrologic impact of climate change in the Saguenay watershed: Comparison of downscaling methods and hydrologic models: J. Hydrology, 307(1), 145-163. Holton, J. R., and Hakim, G. J., 2012, An Introduction to Dynamic Meteorology: Academic Press. IPCC-TGCIA, 2004, Guidelines for use of climate scenarios developed from statistical downscaling methods: Intergovernmental Panel on Climate Change: Task Group on Data and Scenario Support for Impacts and Climate Analysis. Lopes, P. M. d. A. G., 2008, Assessment of climate change statistical downscaling methods: Application and comparison of two statistical methods to a single site in Lisbon: Diss. FCT-UNL. Mitchell, T. D., 2003, Pattern scaling: An examination of the accuracy of the technique for describing future climates: Climatic Change, 60(3), 217-242. Pierce, D. W., Das, T., Cayan, D. R., Maurer, E. P., Miller, N. L., Bao, Y., and Sloan, L. C, 2013, Probabilistic estimates of future changes in California temperature and precipitation using statistical and dynamical downscaling: Climate Dynamics, 40(3-4), 839-856. Samadi, S., Carbone, G. J., Mahdavi, M., Sharifi, F., and Bihamta, M., 2013, Statistical downscaling of river runoff in a semi-arid catchment: Water Resources Management, 27(1), 117-136. Schubert, S., and Henderson-Sellers, A., 1997, A statistical model to downscale local daily temperature extremes from synoptic-scale atmospheric circulation patterns in the Australian region: Climate Dynamics, 13(3), 223-234. Wilby, R. L., Dawson, C. W., and Barrow, E. M., 2002, SDSM—a decision support tool for the assessment of regional climate change impacts: Environmental Modelling & Software, 17(2), 145-157. Wilby, R. L., and Harris, I., 2006, A framework for assessing uncertainties in climate change impacts: Low-flow scenarios for the River Thames:, UK. Water Resources Research, 42(2), W02419. Wilby, R., 2007, A review of climate change impacts on the built environment: Built Environment, 33(1), 31-45. Wilks, D.S., 2006, Statistical Methods in the Atmospheric Sciences: Vol. 59 of International Geophysics Series, Academic Press. Zulkaranian, H., and Harun, S., 2012, Application of statistical downscaling model for long lead rainfall prediction in kurau river catchment of Malaysia: Malaysian Journal of Civil Engineering, 24(1), 1-12.